Following the Copyright Act of 1976, copyright would last for the life of the author plus 50 years, or 75 years for a work of corporate authorship. The 1976 Act also increased the extension term for works copyrighted before 1978 that had not already entered the public domain from 28 years to 47 years, giving a total term of 75 years. The 1998 Act extended these terms to life of the author plus 70 years and for works of corporate authorship to 120 years after creation or 95 years after publication, whichever end is earlier. Copyright protection for works published before January 1, 1978, was increased by 20 years to a total of 95 years from their publication date. This law, also known as the Sonny Bono Copyright Term Extension Act, Sonny Bono Act, or (derisively) the Mickey Mouse Protection Act, effectively "froze" the advancement date of the public domain in the United States for works covered by the older fixed term copyright rules. Under this Act, works made in 1923 or afterwards that were still protected by copyright in 1998 would not enter the public domain until January 1, 2019 or later. Mickey Mouse specifically, having first appeared in 1928, will be in a public domain work in 2024 or afterward (depending on the date of the product) unless the owner of the copyright releases them into the public domain before then. 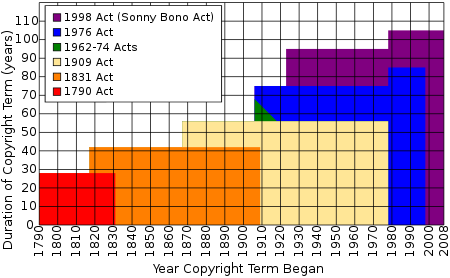 Unlike copyright extension legislation in the European Union, the Sonny Bono Act did not revive copyrights that had already expired. The Act did extend the terms of protection set for works that were already copyrighted, and is retroactive in that sense. However, works created before January 1, 1978, but not published or registered for copyright until recently, are addressed in a special section (17 U.S.C. § 303) and may remain protected until the end of 2047. The Act became Pub.L. 105–298 on October 27, 1998. Under the international Berne Convention for the Protection of Literary and Artistic Works of 1886, the signatory countries are required to provide copyright protection for a minimum term of the life of the author plus fifty years. Additionally, they are permitted to provide for a longer term of protection. The Berne Convention did not come into force for the United States until it was ratified on March 1, 1989, but the U.S. had previously provided for the minimum copyright term the convention required in the Copyright Act of 1976. Since 1990, The Walt Disney Company had lobbied for copyright extension. The legislation delayed the entry into the public domain of the earliest Mickey Mouse movies, leading detractors to the nickname "The Mickey Mouse Protection Act". Other parties that lobbied in favor of the Bono Act were Time Warner, Universal, Viacom, the major professional sports leagues (NFL, NBA, NHL, MLB), and the family of slain singer Selena Quintanilla-Pérez. Proponents reject the idea that only works in the public domain can provide artistic inspiration. They note that opponents fail to take into account that copyright applies only to expressions of ideas and not the ideas themselves. Thus artists are free to get ideas from copyrighted works as long as they do not infringe. Borrowing ideas and such are common in film, TV and music even with copyrighted works (see scènes à faire, idea-expression divide and stock character). Works such as parody benefit from fair use. One argument against the CTEA is focused on the First Amendment. In Harper & Row v. Nation Enterprises, however, the court explained how a copyright "respects and adequately safeguards the freedom of speech protected by the First Amendment." In following this approach, courts have held that copyrights are "categorically immune from challenges under the First Amendment." Critics of the CTEA argue that it was never the original intention for copyright protection to be extended in the United States. Attorney Jenny L. Dixon mentions that "the United States has always viewed copyright primarily as a vehicle for achieving social benefit based on the belief that encouragement of individual effort by personal gain is the best way to advance the public welfare;" however, "the U.S. does not consider copyright as a 'natural right.'" Dixon continues that with increased extensions on copyright protections, authors receive the benefits, while the public have more difficulty accessing these works, weakening public domain. One such extension Dixon mentions is the protection of a copyrighted work for the author's life followed by two generations, which opponents argue that there is no legislation nor intention for this copyright protection. "These constitutionally-grounded arguments 'for limitations on proprietary rights' are being rejected time and time again." Another argument against the CTEA is focused on the First Amendment "because of the prospective and retrospective application of the CTEA." The plaintiffs in Eldred v. Reno believed that "the CTEA failed to sustain the intermediate level of scrutiny test afforded by the First Amendment because the government did not have an 'important' interest to justify withholding speech." In 2003, the plaintiffs in the Eldred case began to shift their effort toward the U.S. Congress in support of a bill called the Public Domain Enhancement Act that would make the provisions of the Bono Act apply only to copyrights that had been registered with the Library of Congress. In 2012, law professors Christopher Buccafusco and Paul J. Heald performed tests of three key justifications of copyright extension, namely: that public domain works will be underutilized and less available, will be oversaturated by poor quality copies, and poor quality derivative works will harm the reputation of the original works. They compared works from the two decades surrounding 1923 made available as audiobooks. They found that copyrighted works were significantly less likely to be available than public domain ones, found no evidence of overexploitation driving down the price of works, and that the quality of the audiobook recordings did not significantly affect the price people were willing to pay for the books in print. Heald's later experiment analyzing a random sample of newly-posted works on Amazon.com revealed that public domain works from 1880 were posted at double the rate of copyrighted works from 1980. ^ (www.copyright.gov), U.S. Copyright Office. "U.S. Copyright Office - Certain Unpublished, Unregistered Works Enter Public Domain". www.copyright.gov. Retrieved 2018-01-14. ^ "Mickey's Headed to the Public Domain! But Will He Go Quietly? - Office of Copyright". Office of Copyright. 2014-10-17. Retrieved 2018-01-14. ^ "THOMAS: Status of H.R. 2589". Thomas.loc.gov. Retrieved 2011-01-21. ^ "THOMAS: Status of S. 505". Thomas.loc.gov. Retrieved 2011-01-21. ^ "Senate Report 104-315". Thomas.loc.gov. Retrieved 2011-01-21. ^ "S.483 - Copyright Term Extension Act of 1996". Congress.gov. 1996-07-10. Retrieved 2014-12-15. ^ a b Greenhouse, Linda (2002-02-20). "Justices to Review Copyright Extension". The New York Times. Retrieved 2016-02-12. The 1998 extension was a result of intense lobbying by a group of powerful corporate copyright holders, most visibly Disney, which faced the imminent expiration of copyrights on depictions of its most famous cartoon characters. ^ a b Ota, Alan K. (1998-08-10). "Disney In Washington: The Mouse That Roars". CNN. Retrieved 2016-02-12. ^ "H9952". Congressional Record. Government Printing Office. October 7, 1998. Retrieved 2007-10-30. ^ a b "Senator Orrin Hatch's Introduction of The Copyright Term Extension Act of 1997". 1997-03-20. ^ a b c "Senator Dianne Feinstein's Statement before Congress". 1997-03-20. ^ a b c d e "Excerpts of Bruce A. Lehman's statement before Congress". 1995-09-20. ^ a b c d e Scott M. Martin (September 24, 2002). "The Mythology of the Public Domain: Exploring the Myths Behind Attacks on the Duration of Copyright Protection". Loyola of Los Angeles Law Review. Loyola Law Review. 36 (1): 280. ISSN 1533-5860. Retrieved 2007-11-17. ^ Carter, Bill (1994-12-19). "THE MEDIA BUSINESS; Television". New York Times. pp. D10. Retrieved 2010-11-27. ^ See Two Days of Christmas Classics, TORONTO STAR, December 24, 1999, At E1. ^ a b c d Grzelak, Victoria A. (2002). "Mickey Mouse & Sonny Bonno Go to Court: The Copyright Term Extension Act and its Effect on Current and Future Rights". Retrieved May 25, 2017. ^ a b c d e Dixon, Jenny L. "The Copyright Term Extension Act: Is Life Plus Seventy Too Much". Retrieved May 26, 2017. ^ Karjala, Dennis. "Opposing Copyright Extension, Legislative Materials (105th Congress), Statement of Copyright and Intellectual Property Law Professors in Opposition to H.R. 604, H.R. 2589, and S.505". Retrieved 22 August 2015. ^ "Keeping Copyright in Balance". The New York Times. February 21, 1998. ^ "BRIEF OF INTELLECTUAL PROPERTY LAW PROFESSORS AS AMICI CURIAE SUPPORTING PETITIONERS" (PDF). Retrieved 2011-01-21. ^ "Cornell University Law School – United States Constitution". Law.cornell.edu. Retrieved 2011-01-21. ^ "Life Expectancies in 1800s". Answers.com. Retrieved 2011-01-21. ^ "Life Expectancies in 20002". Medical News Today. Archived from the original on 2010-12-19. Retrieved 2011-01-21. ^ "United States Patent and Trademark Office – General Information". Uspto.gov. Retrieved 2011-01-21. ^ "BRIEF OF GEORGE A. AKERLOF, KENNETH J. ARROW, TIMOTHY F. BRESNAHAN, JAMES M. BUCHANAN, RONALD H. COASE, LINDA R. COHEN, MILTON FRIEDMAN, JERRY R. GREEN, ROBERT W. HAHN, THOMAS W. HAZLETT, C. SCOTT HEMPHILL, ROBERT E. LITAN, ROGER G. NOLL, RICHARD SCHMALENSEE, STEVEN SHAVELL, HAL R. VARIAN, AND RICHARD J. ZECKHAUSER AS AMICI CURIAE IN SUPPORT OF PETITIONERS" (PDF). Archived from the original (PDF) on 2 April 2015. Retrieved 22 August 2015. ^ Lawrence Lessig. ""only if the word 'no-brainer' appears in it somewhere": RIP Milton Friedman". Archived from the original on 2 April 2015. Retrieved 22 August 2015. No doubt the highpoint of the Eldred v. Ashcroft case was when I learned Friedman would sign our "Economists’ Brief": As it was reported to me, when asked, he responded: "Only if the world [sic] ‘no brainer’ appears in it somewhere." A reasonable man, he signed even though we couldn’t fit that word in. ^ Macavinta, Courtney. "CNET – Copyright extension law". News.cnet.com. Retrieved 2011-01-21. ^ "Winnie the Pooh – FAQ – Your Frequently Asked Questions X". Lavasurfer.com. Retrieved 2011-01-21. ^ "Salon.com Technology | Mickey Mouse vs. The People". Archive.salon.com. 2002-02-21. Archived from the original on 2009-04-22. Retrieved 2011-01-21. ^ Howard Besser, The Erosion of Public Protection: Attacks on the concept of Fair Use, Paper delivered at the Town Meeting on Copyright & Fair Use, College Art Association, Toronto, February 1998. Retrieved 2010-07-27. ^ http://hdl.loc.gov/loc.uscongress/legislation.105hamdt532 "Handle Problem Report (Library of Congress)". Hdl.loc.gov. Retrieved 2011-02-06. ^ http://hdl.loc.gov/loc.uscongress/legislation.105hamdt533 "Handle Problem Report (Library of Congress)". Hdl.loc.gov. Retrieved 2011-02-06. ^ Timothy B. Lee (October 25, 2013). "15 years ago, Congress kept Mickey Mouse out of the public domain. Will they do it again?". Washington Post. ^ Buccafusco, Christopher; Heald, Paul J. (2012-08-15). "Do Bad Things Happen When Works Enter the Public Domain? : Empirical Tests of Copyright Term Extension". Berkeley Technology Law Journal. SSRN 2130008. ^ Heald, Paul J. (2013-07-05). "How Copyright Keeps Works Disappeared". University of Illinois, Public Law & Legal Theory, Research Paper Series. SSRN 2290181. This page was last edited on 12 March 2019, at 06:46 (UTC).